We get it. It’s always gloomy out, the sun is nowhere to be seen, and that horrible smell like something has thrown up smoke through a sewer pipe…we all hate the haze. 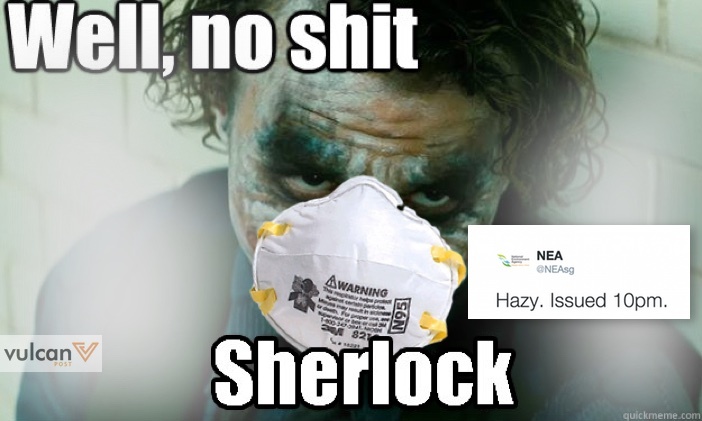 But what we hate more than the haze is people telling us that there is haze like it’s new information. Needless to say, Singaporeans were upset. See if you can spot the pattern here. @NEAsg well you don't say ? YOU DON’T SAY???? RT @NEAsg: Hazy. Issued 5pm. And if you thought “once bitten twice shy”, well you thought wrong. Five hours later, it happened again. @NEAsg wow I didn't know that! In a way, I almost feel bad for the NEA. Their website has gone down several times, and some have reported that their app too has stopped working a few times. Haze season always brings droves of Singaporeans to their site, and since we’re so used to having things our way (the efficient, never breaks down way), we’re quick to point fingers at the only people who can provide us with what we really want — a reason not to go into work and instead lock ourselves in the house all day. In the meantime, other companies are trying to capitalise on this haze situation. Spotify, for example, has released a haze playlist called Hazed and Confused, with hit tracks like “Harder to Breathe”, “Wake Me Up When September Ends”, and “Smoke Gets In Your Eyes”. Very funny, guys.